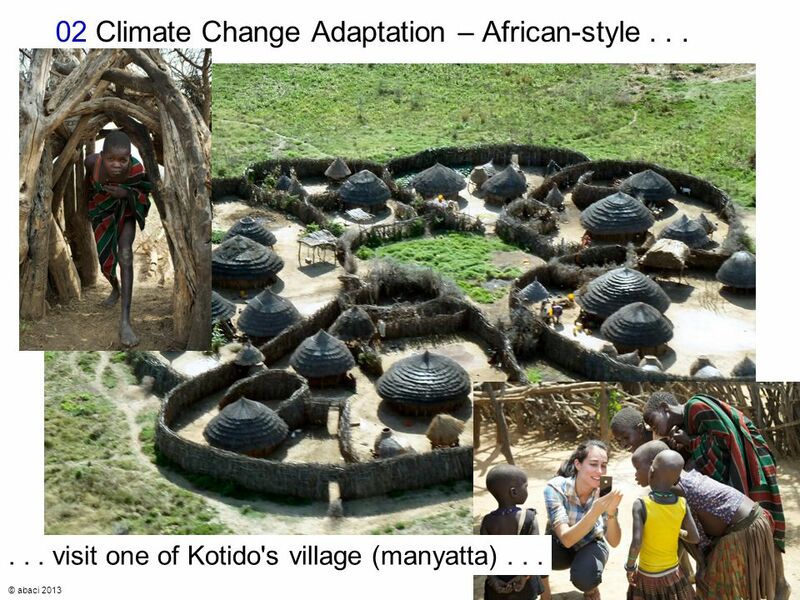 Exploiting Complexity abaci The Partnership Climate Change Adaptation - An African Example Patrick Beautement A presentation to: CAT Members Conference. 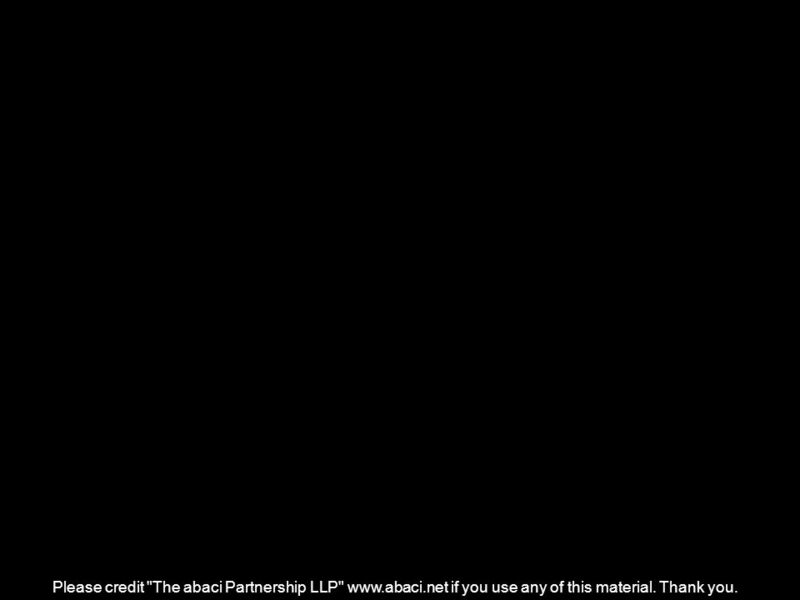 3 © abaci 2013 3 POWERDOWN Halogen LED 01 Climate Change Adaptation – UK-style... 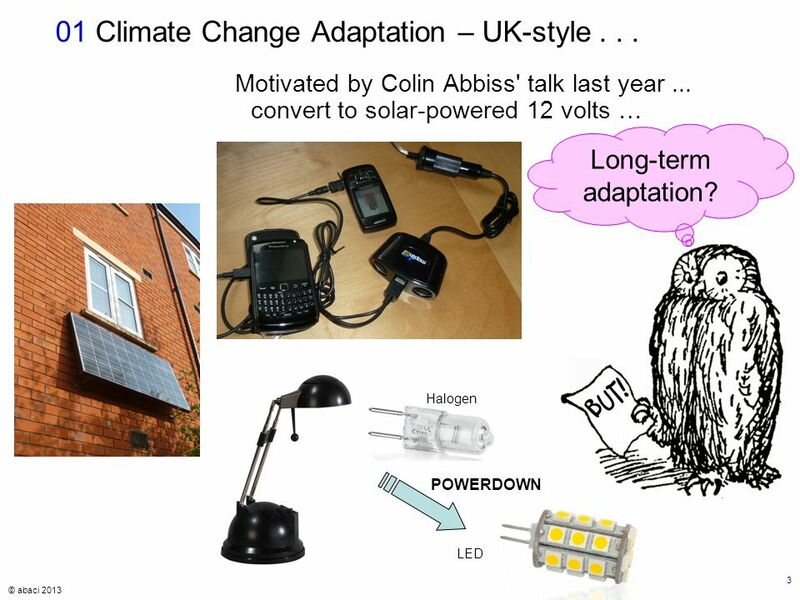 Motivated by Colin Abbiss' talk last year... convert to solar-powered 12 volts … Long-term adaptation? 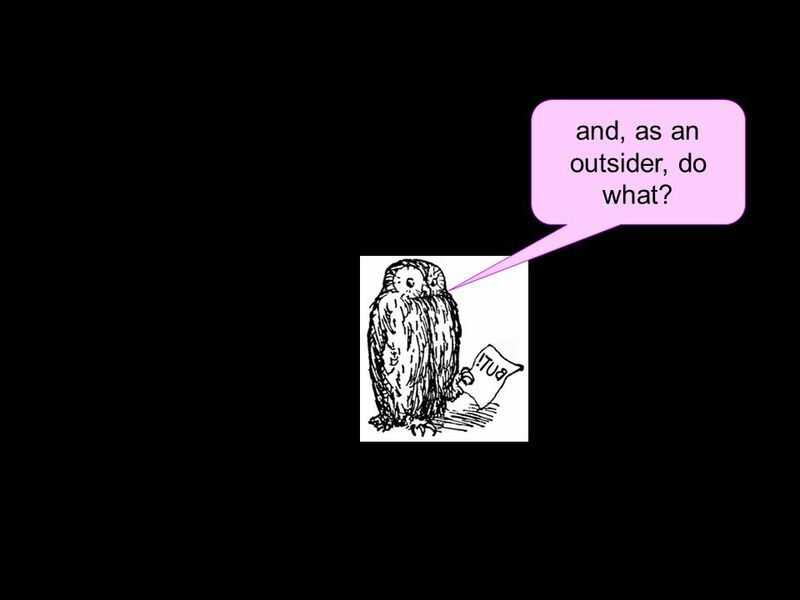 9 and, as an outsider, do what? 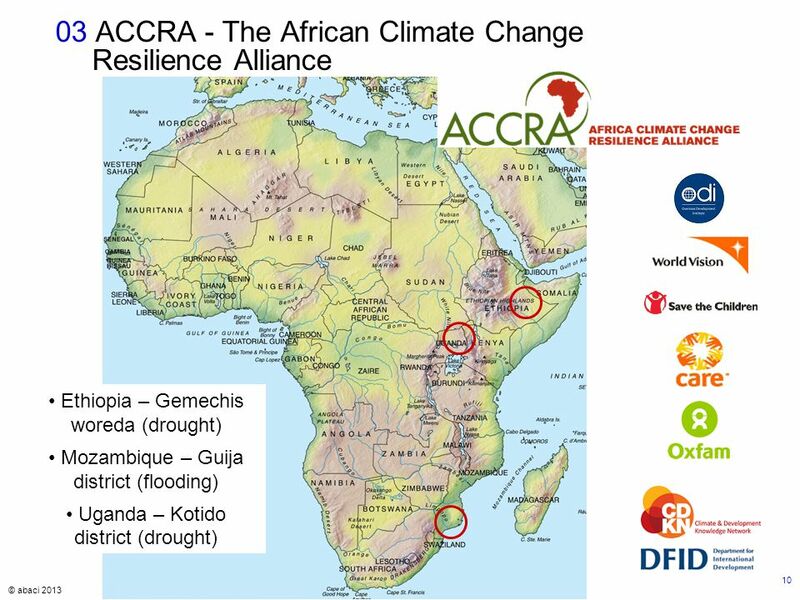 11 © abaci 2013 11 03 ACCRA - The African Climate Change Resilience Alliance ACCRA's... objectives are to: – increase governments' and development actors' use of evidence. 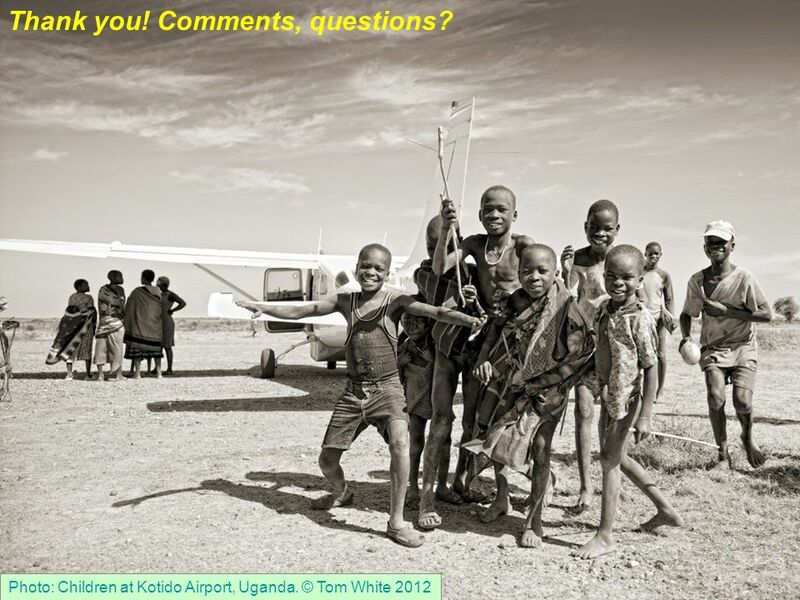 insights are used for: – designing and implementing both humanitarian and development interventions. 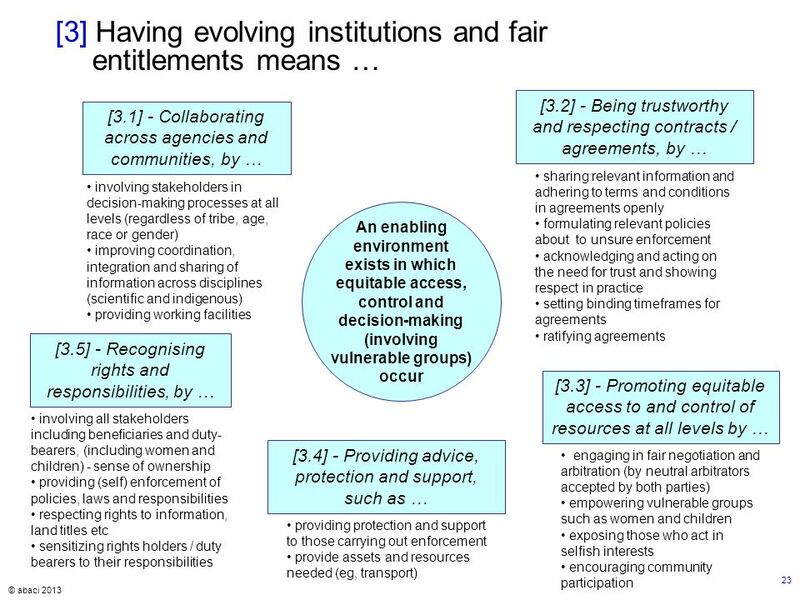 value is that it: – works 'bottom-up' at the district level to increase poor and vulnerable communities' adaptive capacity. Which means what in practice? 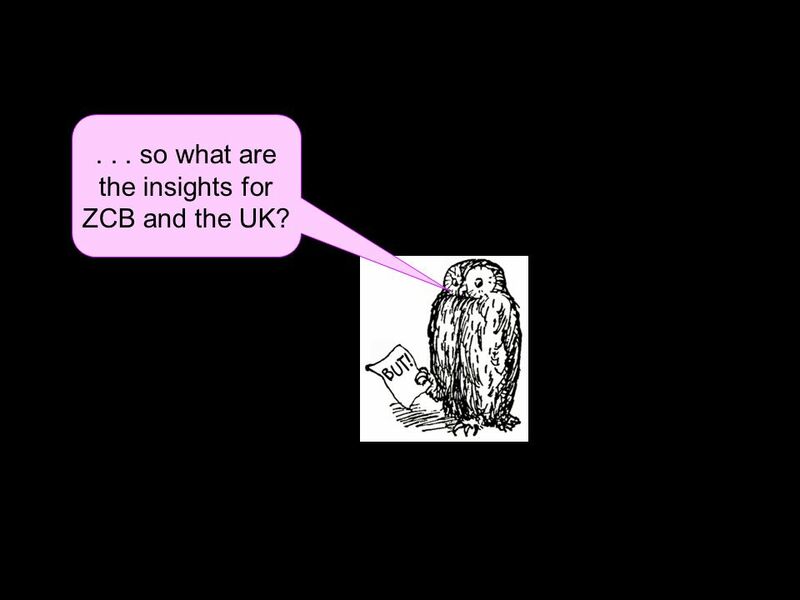 14 ... so what are the insights for ZCB and the UK? 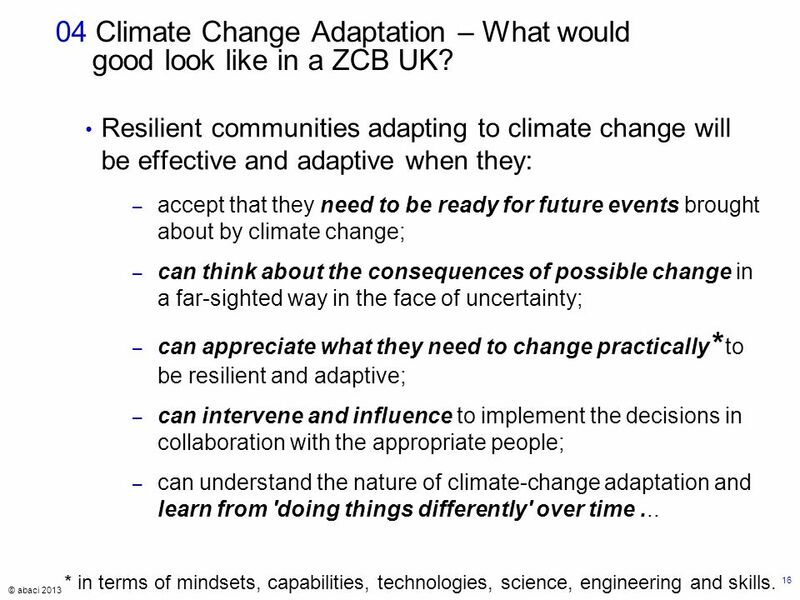 16 © abaci 2013 16 04 Climate Change Adaptation – What would good look like in a ZCB UK? 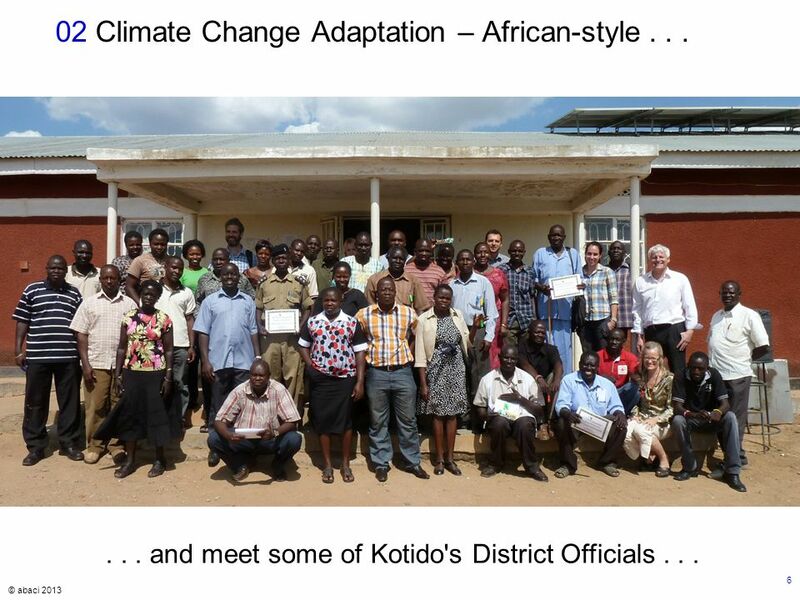 Resilient communities adapting to climate change will be effective and adaptive when they: – accept that they need to be ready for future events brought about by climate change; – can think about the consequences of possible change in a far-sighted way in the face of uncertainty; – can appreciate what they need to change practically * to be resilient and adaptive; – can intervene and influence to implement the decisions in collaboration with the appropriate people; – can understand the nature of climate-change adaptation and learn from 'doing things differently' over time... * in terms of mindsets, capabilities, technologies, science, engineering and skills. 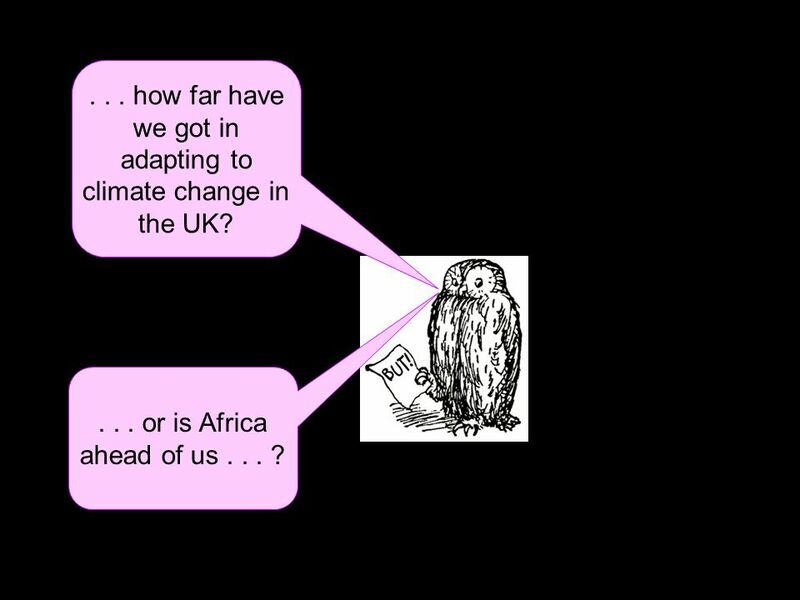 17 ... how far have we got in adapting to climate change in the UK?... 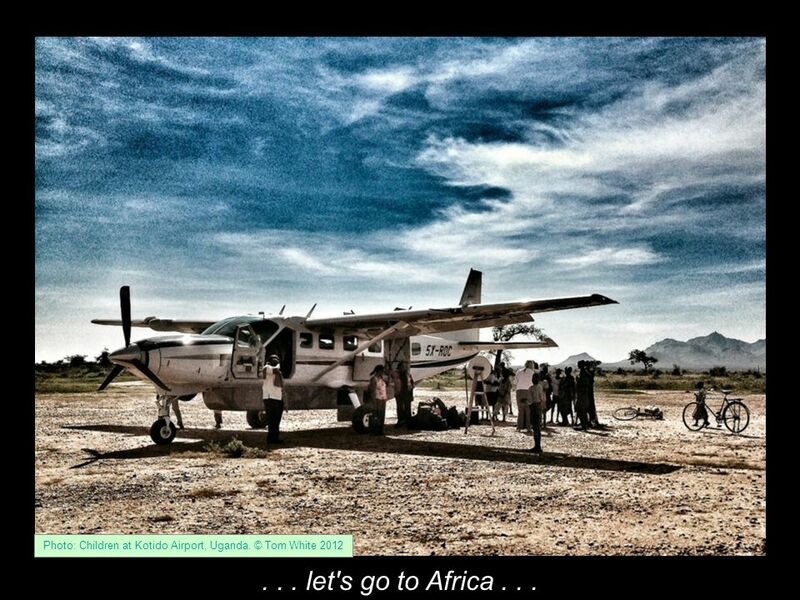 or is Africa ahead of us... ? 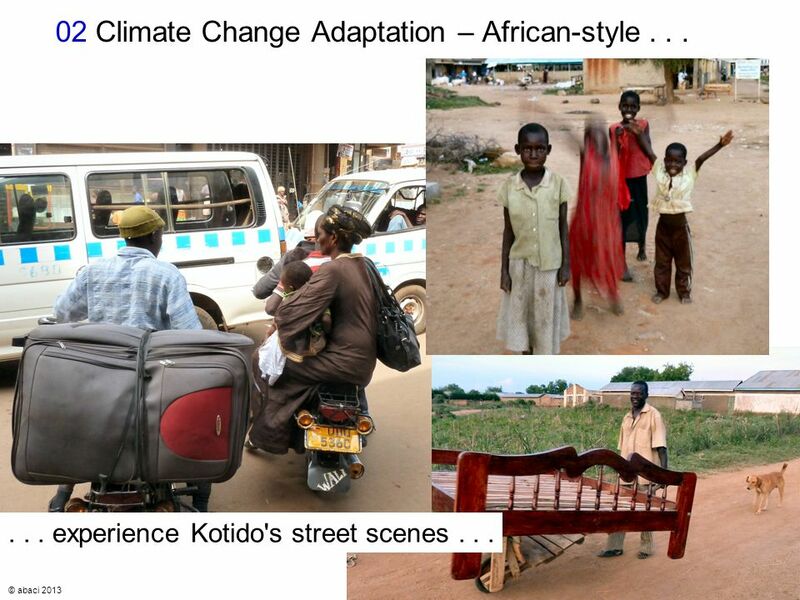 19 © abaci 2013 19 References: ACCRA, 2013. 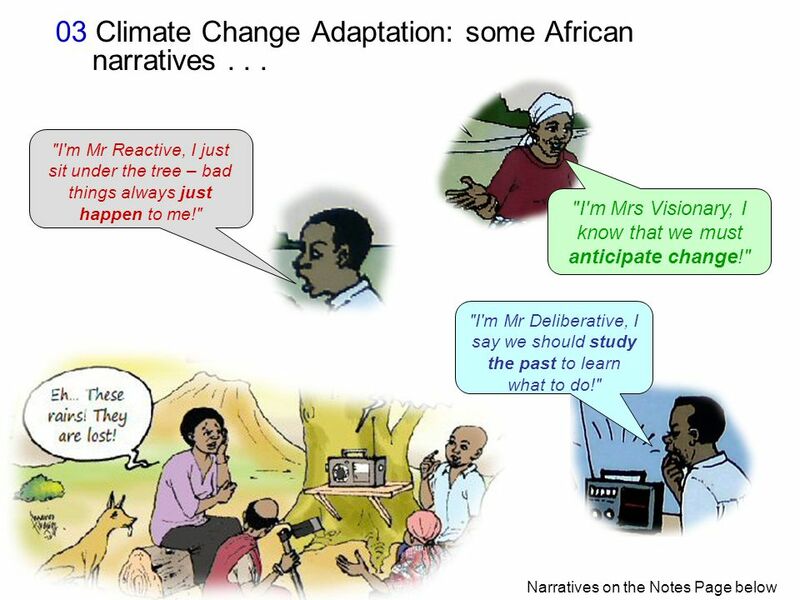 Narratives and Posters about different ways of adapting to climate change. Available from: http://www.abaci.net/library/lib-index.htm http://www.abaci.net/library/lib-index.htm Beautement, P., Broenner, C. (2011). Complexity Demystified - a Guide for Practitioners. Triarchy Press, Axminster. Beautement, P., Broenner, C. (2009a). Outcomes from the Workshop - Putting Complexity to Work- Supporting the Practitioners. ECCS White Paper. [online] http://www.abaci.net/library/eccs09_pctw_white- paper_v1-1.pdfhttp://www.abaci.net/library/eccs09_pctw_white- paper_v1-1.pdf Cohen, J. and Stewart, I. (2000). The Collapse of Chaos. Discovering Simplicity in a Complex World, Penguin Books, London. Dodd, L., Stamp, G. and Prins, G. (2007). Staged Appreciation to support the journey from closed to open. 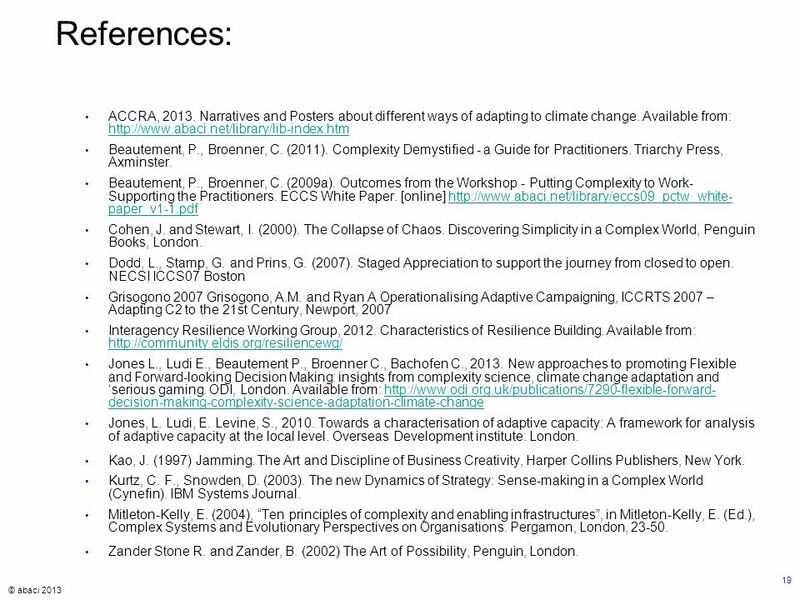 NECSI ICCS07 Boston Grisogono 2007 Grisogono, A.M. and Ryan A Operationalising Adaptive Campaigning, ICCRTS 2007 – Adapting C2 to the 21st Century, Newport, 2007 Interagency Resilience Working Group, 2012. Characteristics of Resilience Building. Available from: http://community.eldis.org/resiliencewg/ http://community.eldis.org/resiliencewg/ Jones L., Ludi E., Beautement P., Broenner C., Bachofen C., 2013. 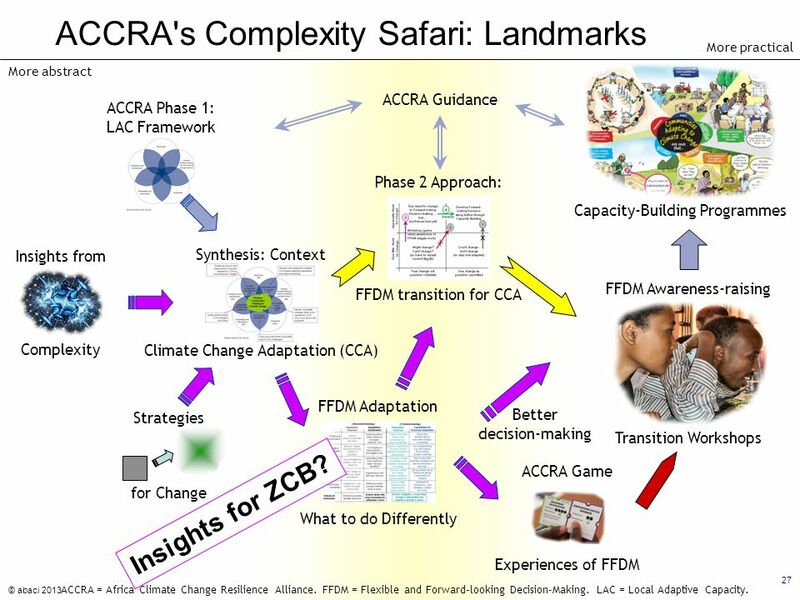 New approaches to promoting Flexible and Forward-looking Decision Making: insights from complexity science, climate change adaptation and ‘serious gaming. ODI, London. 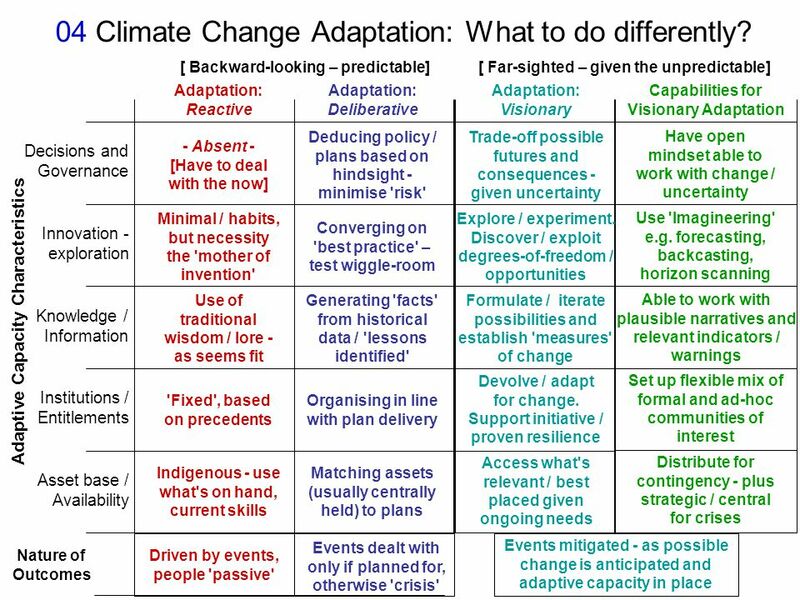 Available from: http://www.odi.org.uk/publications/7290-flexible-forward- decision-making-complexity-science-adaptation-climate-changehttp://www.odi.org.uk/publications/7290-flexible-forward- decision-making-complexity-science-adaptation-climate-change Jones, L. Ludi, E. Levine, S., 2010. 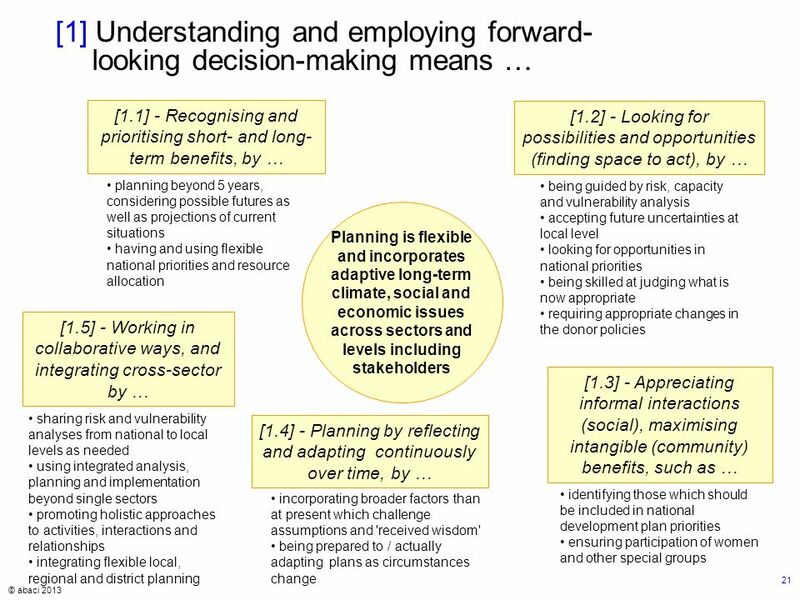 Towards a characterisation of adaptive capacity: A framework for analysis of adaptive capacity at the local level. Overseas Development institute: London. Kao, J. (1997) Jamming. The Art and Discipline of Business Creativity, Harper Collins Publishers, New York. Kurtz, C. F., Snowden, D. (2003). The new Dynamics of Strategy: Sense-making in a Complex World (Cynefin). IBM Systems Journal. Mitleton-Kelly, E. (2004), “Ten principles of complexity and enabling infrastructures”, in Mitleton-Kelly, E. (Ed. ), Complex Systems and Evolutionary Perspectives on Organisations. Pergamon, London, 23-50. Zander Stone R. and Zander, B. (2002) The Art of Possibility, Penguin, London. 28 © abaci 2013 28 Eleven principles that underpin climate change adaptation and resilience issues The following principles, as they are derived from complexity science insights, reflect the integrative and iterative manner in which ongoing effective CCA can be maximised: Principle 1: Dynamic, ongoing 'complex' CCA can be influenced purposefully. Principle 2: Context understanding is diverse – there is no 'single view of the truth'. Principle 3: Change is ongoing, dynamic and multi-level – there is no 'end-state'. Principle 4: There are many qualities of power and influence to accommodate. Principle 5: It is necessary to appreciate who is/what are best placed to bring about change. Principle 6: CCA requires that 'interventions' have the necessary Requisite Variety, i.e. have appropriate 'Complexity-Worthiness' given the desired changes. 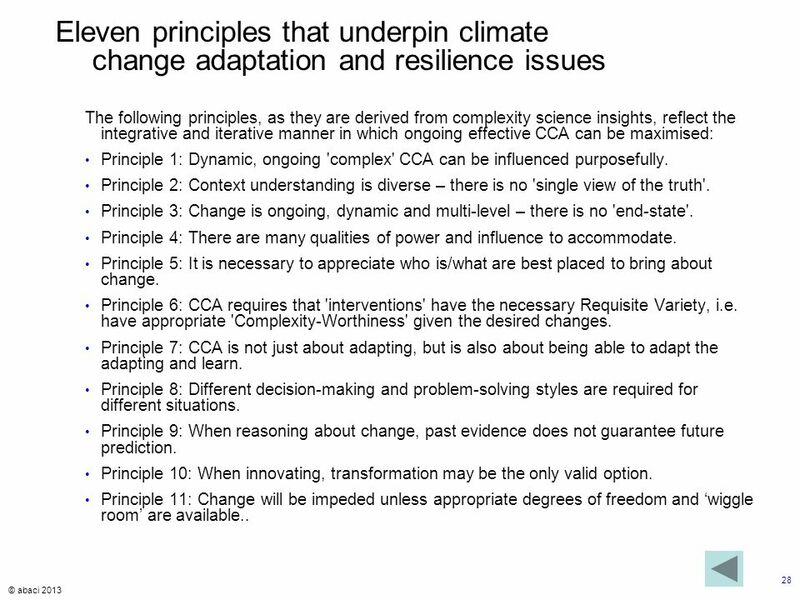 Principle 7: CCA is not just about adapting, but is also about being able to adapt the adapting and learn. Principle 8: Different decision-making and problem-solving styles are required for different situations. Principle 9: When reasoning about change, past evidence does not guarantee future prediction. Principle 10: When innovating, transformation may be the only valid option. 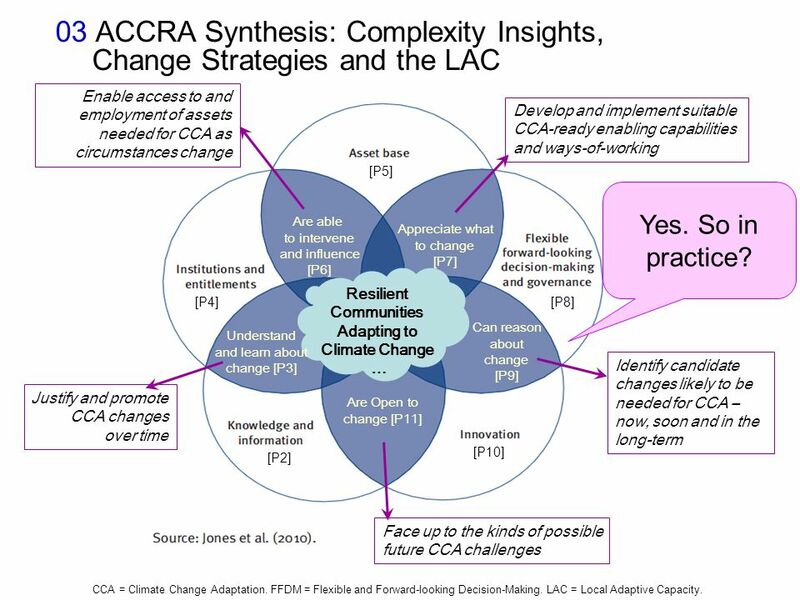 Principle 11: Change will be impeded unless appropriate degrees of freedom and ‘wiggle room’ are available..
29 03 ACCRA Synthesis: Complexity Insights, Change Strategies and the LAC Resilient Communities Adapting to Climate Change … Are Open to change [P11] Can reason about change [P9] Are able to intervene and influence [P6] Appreciate what to change [P7] Understand and learn about change [P3] [P2] [P8][P4] [P5] [P10] Develop and implement suitable CCA-ready enabling capabilities and ways-of-working Identify candidate changes likely to be needed for CCA – now, soon and in the long-term Face up to the kinds of possible future CCA challenges Justify and promote CCA changes over time Enable access to and employment of assets needed for CCA as circumstances change CCA = Climate Change Adaptation. 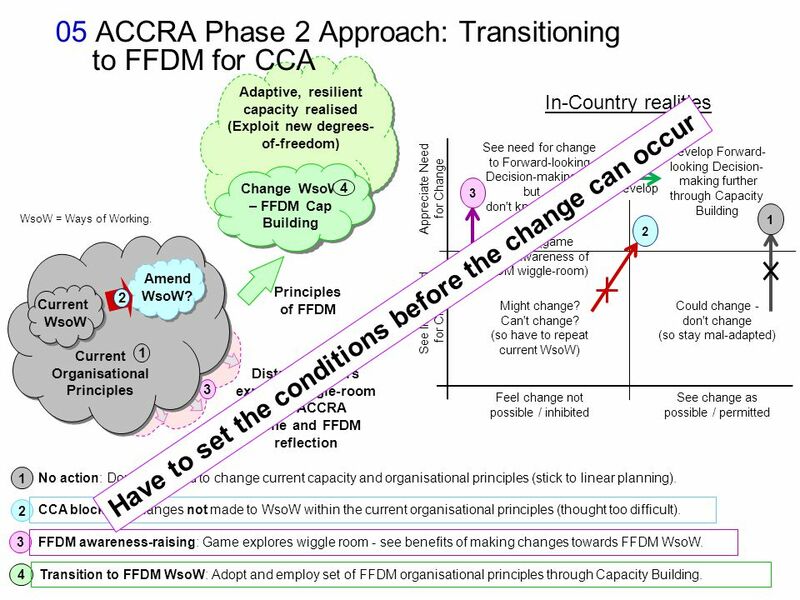 FFDM = Flexible and Forward-looking Decision-Making. 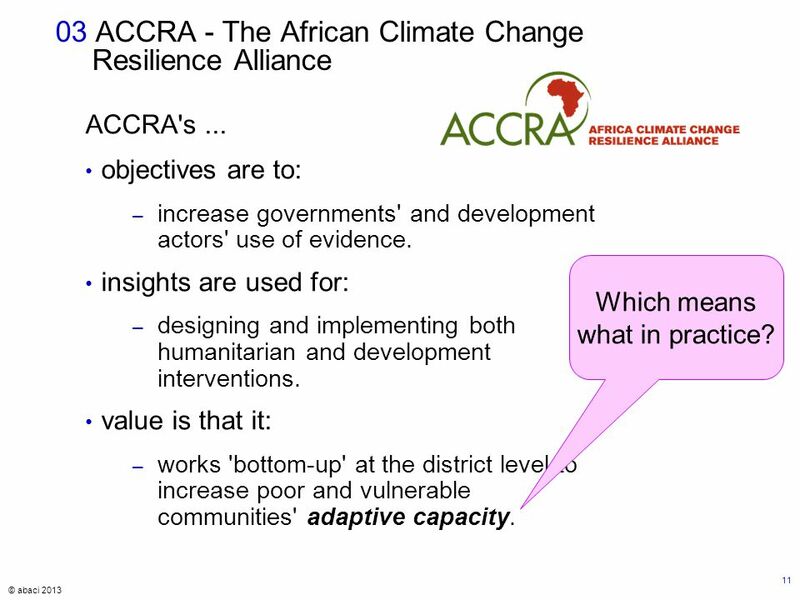 LAC = Local Adaptive Capacity. Yes. So in practice? 31 © abaci 2013 31 07 FFDM Awareness Raising: ACCRA In- country Workshops Held in Uganda (2012), and Ethiopia and Mozambique. 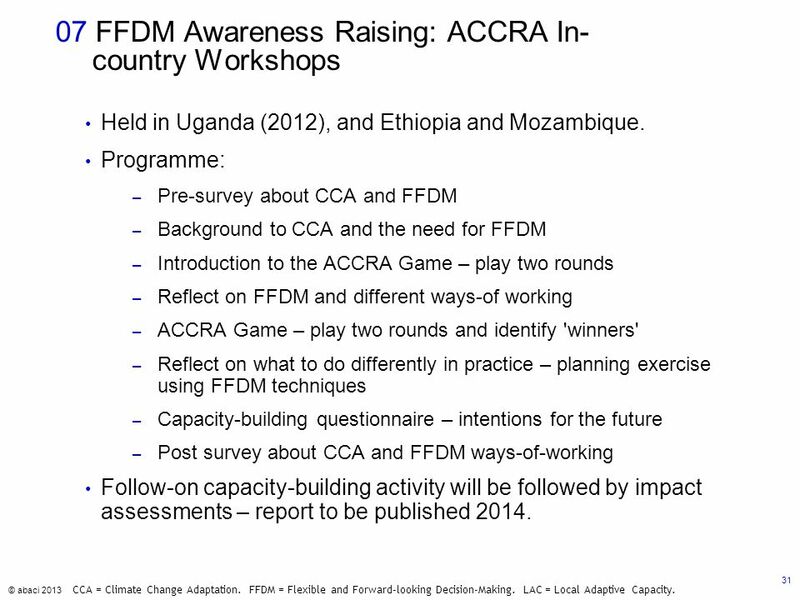 Programme: – Pre-survey about CCA and FFDM – Background to CCA and the need for FFDM – Introduction to the ACCRA Game – play two rounds – Reflect on FFDM and different ways-of working – ACCRA Game – play two rounds and identify 'winners' – Reflect on what to do differently in practice – planning exercise using FFDM techniques – Capacity-building questionnaire – intentions for the future – Post survey about CCA and FFDM ways-of-working Follow-on capacity-building activity will be followed by impact assessments – report to be published 2014. 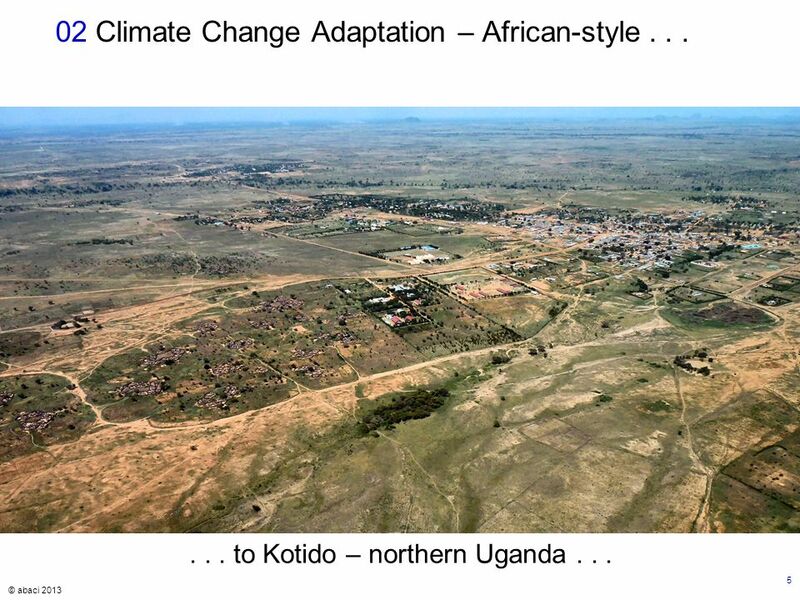 CCA = Climate Change Adaptation. FFDM = Flexible and Forward-looking Decision-Making. 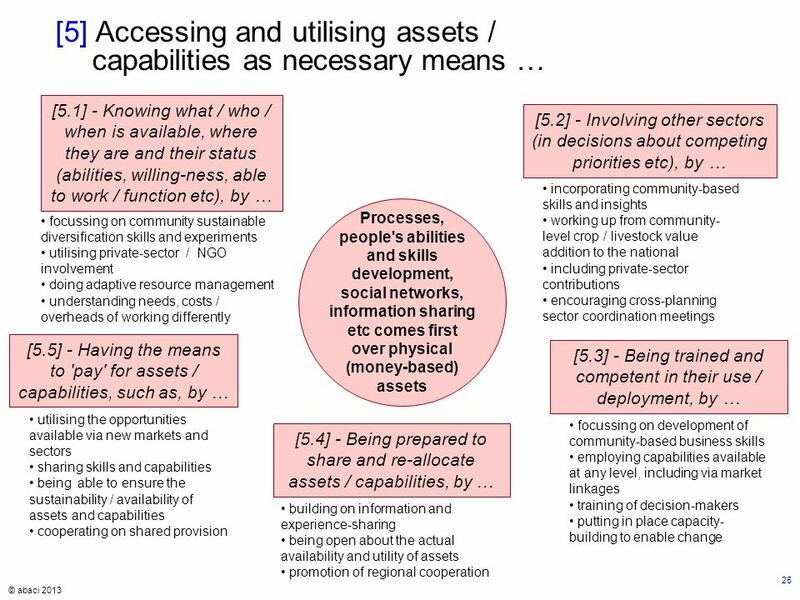 LAC = Local Adaptive Capacity. 32 Please credit "The abaci Partnership LLP" www.abaci.net if you use any of this material. Thank you. 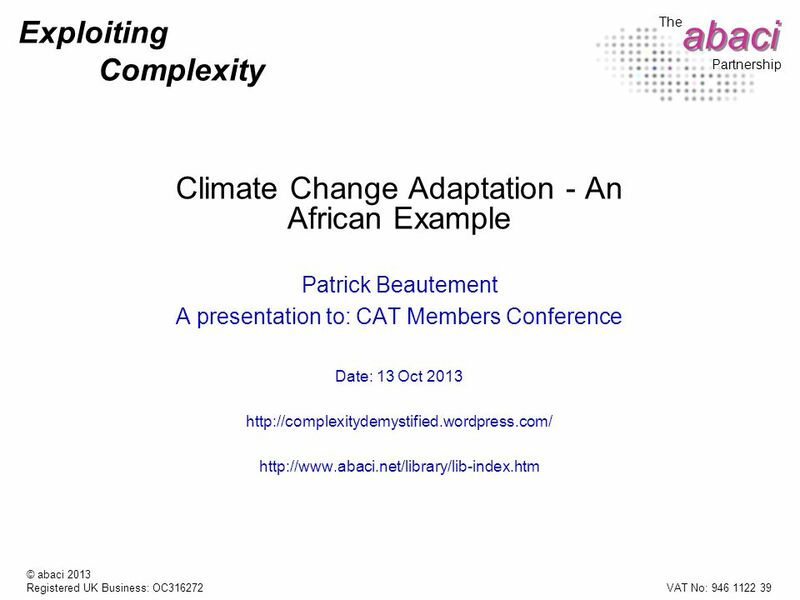 Download ppt "Exploiting Complexity abaci The Partnership Climate Change Adaptation - An African Example Patrick Beautement A presentation to: CAT Members Conference." ACCRA Who we are. What we do, and Save the Children’s role. What have we learnt so far? How have we worked with government, and what have we learnt? Keeping. Supported self-evaluation in assessing the impact of HE Libraries Sharon Markless, King’s College London and David Streatfield, Information Management. 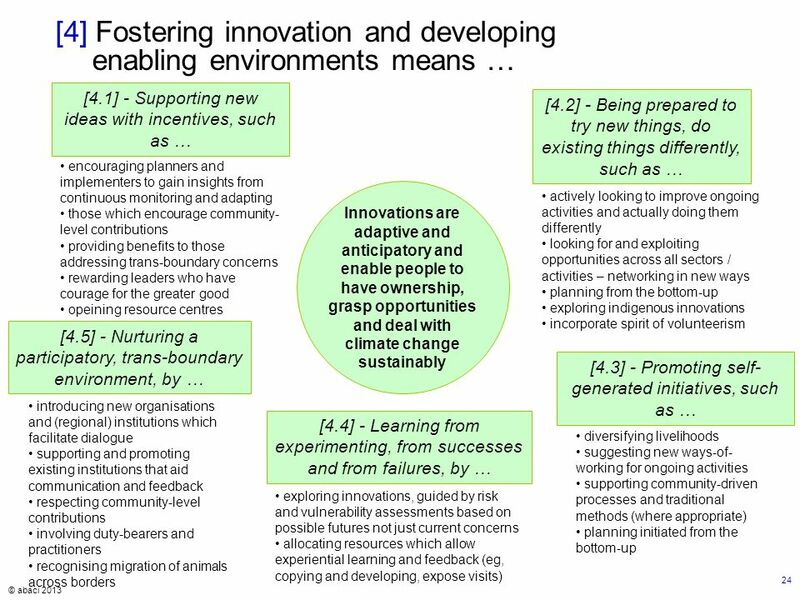 Closing Thoughts Reflections and implications for policy, systemic change and partnerships …in the context of the continuous change towards improvement. 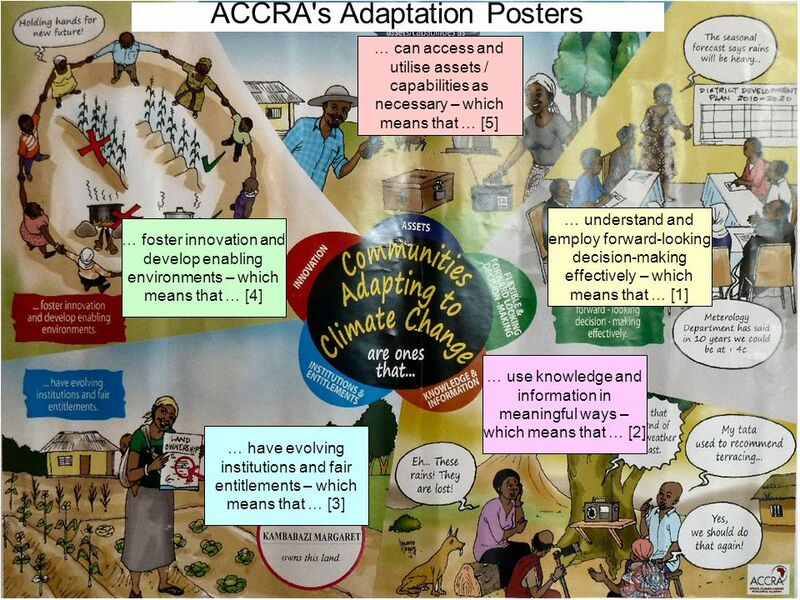 Planning for an Uncertain Future: Promoting adaptation to climate change through Flexible and Forward-looking Decision Making Findings from the Africa. Welcome to The Expert Community Forum 19 November 2007. Brigid Murray Adviser Environment & Society. Programme outline 1. Introduction- context; rationale; aims; objectives; intended outcomes 2. The guidance. In-country CCA / FFDM Posters Post Gemechis Workshop, Ethiopia Updated: 17 Feb 2013 with participants comments (ready for translation to Portuguese for. Open Development Landscape in Uganda Uganda Open Development Stakeholders Workshop, Hotel Africana 11 th - 12 th September 2012. Copyright © May 2014, Montessori Centre International.